Our bollards on hire are available in chrome or gold for that real VIP feel. There are multiple rope colours available, including red, black, blue, yellow, white, pink , purple and green colour options. We also offer tensa barriers in polished silver with retractable black belt. Our bollards and tensa barriers have a rubber rim on the base to stop the posts from slipping or scratching the floor surface. Along with bollard for hire, we also stockA4 and A3 sign holders available in portrait or landscape formats, to complement our bollards and tensa barriers. Our other services include: Artificial Turf and Media wall hire. 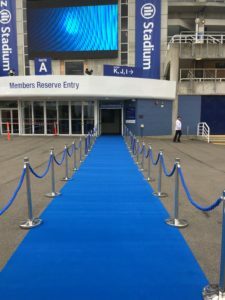 If you are planning an event in Sydney or Melbourne, contact us today to discuss your carpet & bollards requirements.